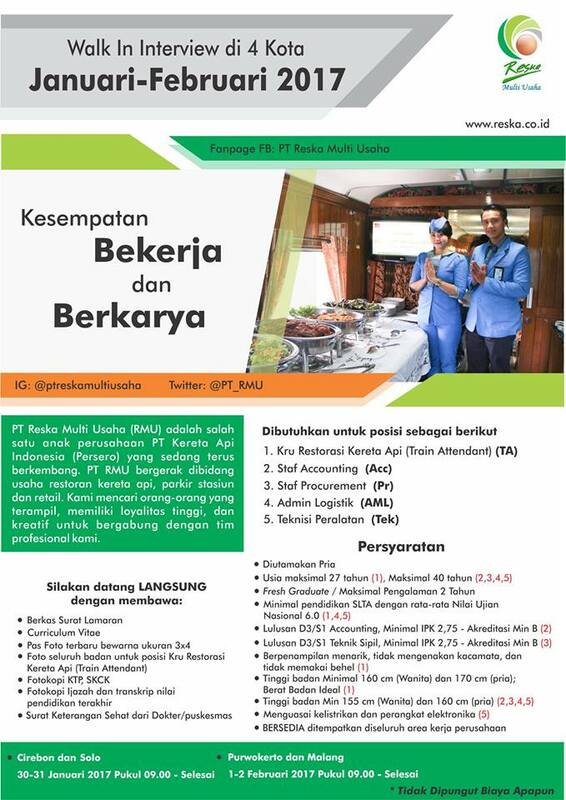 PT Reska Multi Usaha - RMU or referred to as "Reska" is a member state-owned railways operator PT Kereta Api Indonesia (Persero) that is involved in restoration, service on train (SOT), catering, parking, cleaning service, as well as general trading. PT Reska Multi Usaha is majority owned by PT Kereta Api Indonesia (Persero). At present, PT Kereta Api Indonesia (Persero) holds 95.01% shares in Reska with the remainder of the shares belonging to Pusaka Foundation. 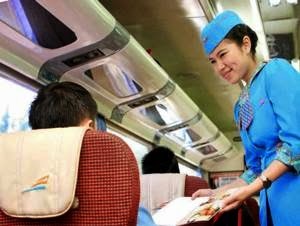 Based in Jakarta, PT Reska Multi Usaha runs its business through 83 trains with 123 Restaurant Trains (KM), 21 locations of land kitchen area and managed parking location at 115 stations spread in 6 area offices; Jakarta, Bandung, Semarang, Yogyakarta, Surabaya and Palembang. PT RMU’s business results in 2015 showed improved performance compared to 2014. According to PT Kereta Api Indonesia (Persero) Annual Report 2015 as quoted by JobsCDC.com, PT Reska Multi Usaha was able to expand total revenue by 4% from Rp 319.52 billion in 2014 to Rp 332.30 billion in 2015. Net profit in 2015 decreased 81% to Rp 2.85 billion from Rp 15.34 billion in 2014. Minimum SMA with minimum average national exam score of 6.00 (TA, AML, Tek). Minimum D3/S1 Accounting with minimum GPA of 2.75 and minimum accreditation B (Acc). Minimum D3/S1 Civil Engineering with minimum GPA of 2.75 and minimum accreditation B (Pr). Good looking,not wearing glasses and dental braces. Minimum height of 160 cm (Female) and 170 cm (Male); ideal weight (TA). Mastering electrical and electronic devices (Tek). Willing to be placed in all working area of RMU. JobsCDC.com now available on android device. Download now on Google Play here. Please be aware of recruitment fraud. The entire stage of this selection process is free of charge. PT Reska Multi Usaha - SMA, D3, S1 Fresh Graduate, Experienced Staff KAI Group January 2017 will never ask for fees or upfront payments for any purposes during the recruitment process such as transportation and accommodation.